Early in my blogging career, I did a review of a number of metronomes for iPhone, recording the tempos at 60 bpm and 120 bpm, and looking at the recordings on a timeline to see the accuracy of each metronome. For a long time, that was my most popular post, and it was amazing how many developers wrote in asking to be considered as well, or to argue with my findings. Last year, I took a look at the different metronomes for the Apple Watch, coming to the conclusion that nothing really worked that well, primarily due to the Apple Watch’s reliance on the iPhone. If you have your iPhone, why even wait for an app to load on your watch? Also, developers were not allowed access to the watch sounds or haptic feedback. 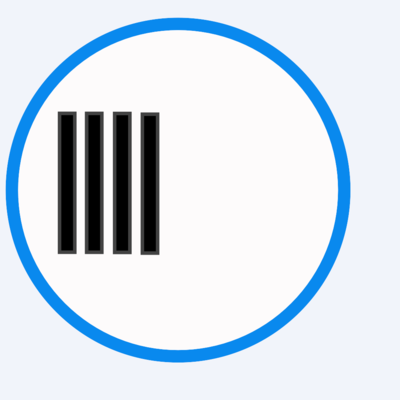 Watch OS 2 fixed some of the Apple Watch’s issues, but there is still a long way to go–and a lot of the WWDC news (Apple’s annual developers conference in June) was centered around a coming watchOS 3 redesign that is going to address many of the issues with the Apple Watch. If you are interested in an Apple Watch–by all means, buy one. Some store was selling an Apple Watch for $45 with the purchase of an iPhone this week. There is no reason to avoid a 1st generation Apple Watch as watchOS 3 will run on the Apple Watch, and we have no idea when we will see a second generation of Apple Watch. Most of us thought that a second watch would have come out in March–and we’re nearly in July. At any rate, Aron Nelson, the developer of unrealBook (a music PDF reader) tweeted about updates to his apps last week, and mentioned Meter Metronome. I hadn’t noticed his metronome app before, but decided to download it simply because it was a metronome app that also had an Apple Watch app, and I generally try to support developers who have made products that I use and recommend. Like all Apple Watch apps, it takes a few seconds for the app to load on the watch–which is one of the things that will be addressed by watchOS 3. When an app loads into memory, it takes long enough that you could take out your phone and do things faster with your phone. In the video, Meter Metronome was the last app that I had used, so it loaded instantly. Once open, the app shows the tempo with two little flashing “blocks.” You can set the tempo by tapping the “tap” bar, rotating the crown (a UI element that makes a lot of sense), and if you tap the flashing blocks, the watch uses the haptic feedback to “tap” the tempo on your wrist. The last element–using haptic feedback–is the new element to me, and why I wanted to share the app on the blog. I am sure that some other metronome must be using this feature on the watch, but when I last looked at watch metronomes, no app had that capability. My only issue with the app is that it doesn’t pop up in searches on the App Store. My only success in finding the app has been to search by the developer’s name (Aron Nelson). So if you are looking for the app, here is a link: https://geo.itunes.apple.com/us/app/meter-metronome/id924386452?mt=8&at=10l9SE. Aron is a developer from Hawaii who writes apps that he uses himself as a gigging musician. The app is currently $0.99, and if you have an Apple Watch, I think it is worth picking up for the haptic touch feature. Just keep in mind that the Apple Watch experience will be much better soon with watchOS 3. Last night I broke down and purchased an Apple Watch. You can finally purchase them at an Apple Store, and the Apple Store at the Mall of America has most of the models in stock (apparently, there are only a few stores in the country that sell the gold model). As much as the Stainless Steel model appeals to me, it costs $200 more, and a recent article discussed how the glass screen (Apple Watch Sport) was actually better than the sapphire screen used in the Apple Watch or Apple Watch Edition in daylight. As a result, I bought the cheapest 42mm watch I could purchase (space grey) with the 2 year Apple Care protection. I think I will be ready to upgrade in two years. There has been a lot written about the Apple Watch, and really, Jim Dalrymple’s recent review has pushed me over the edge with the purchase. I need an external motivator to start getting in better health, and a Fitbit isn’t going to do that for me. Yes, there are some different interactions with the watch that take a few minutes to learn. There has been a lot of griping about the watch not being on “instantly” when you lift your wrist (it is almost instantaneous), as well as the sync time between the watch and various apps. What you have to understand about the Apple Watch is that (for now, until Watch Kit 2.0 in the fall), it relies on the iPhone for data, so you have a temporary lag as the watch updates. That said, it isn’t a long period of time, and I still wait for some web pages on computers longer than I have to wait for the Apple Watch to sync. What is weird, for musicians, is that under Watch Kit 1.0, developers cannot utilize the Watch’s speaker or the haptic touch sensors in the back of the watch. Therefore, things that would seemingly make sense on the Apple Watch (e.g. a metronome that taps you with the tempo instead of playing it) can’t be done. You can get a piano app on the watch, but you need Bluetooth headphones or your iPhone to hear it. My main use of the Apple Watch will never be for music purposes…I have larger devices for that (in fact, I hardly ever use my iPhone for music purposes–98% of my work is done on my iPad, and the other 2% is done on my MacBook). So I want to make it clear that I didn’t buy this Apple Watch specifically for use with music–but that doesn’t mean that I’m not interested to see what it can do. When you buy your Apple Watch, the Apple Watch App syncs all of the apps that you have on your iPhone that also have Apple Watch programming. For me, this included apps like Feedly, The Weather Channel, and so on.As you download other apps (on your iPhone) that have Apple Watch programming, they are added to the watch. Unlike the home screen with a permanent grid of the same apps, the Apple Watch apps appear as little “tiles” on an ever-growing sphere. You can move apps (and delete them), but in general it isn’t too hard to find the app you want. So far, I have downloaded about five iPhone apps that have Apple Watch programming included. 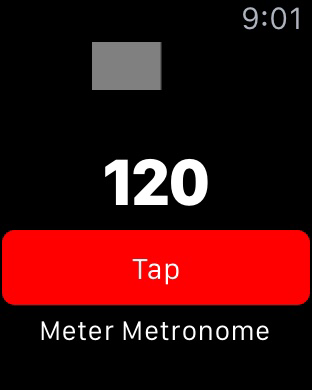 A quick search of the App Store will yield a number of metronomes, which mainly allow you to control the tempo and on/off from your Apple Watch–but still play through your iPhone. I have also downloaded one Piano, one music game, and a version of GarageBand (not from Apple) called “Watch Band.” These apps pretty much summarize what is available on the Apple Watch for musicians at this time. Each of the apps requires the iPhone to produce sound (although I am told that you can attach Bluetooth headphones to the watch and listen that way–but you will never do that in front of a class). Basically, these Apple watch apps simply run an iPhone app. Fully functional, independent apps (that don’t need an Internet connection) will come with Watch Kit 2.0 this fall. You can watch the video I made showing these apps on the Apple Watch below. Additionally: Here is a list of other metronomes I did not download. As you can see, it won’t be long before the App Store is flooded with apps (just as there are hundreds of metronomes on the App Store). So for this brief moment in time, this post represents a nearly summative list of all Apple Watch apps that can be linked to music education & performance. Again, functionality and performance will improve with Watch Kit 2.0 in the fall.